Equilibrium is one of the most important elements of neoclassical economics, but has little to do with real society. Charles Adams is professor of physics at Durham University in the UK and blogs at progressivepulse.org. Anyone that has tried to balance a seesaw – not touching the ground – knows about equilibrium. We know how to adjust our position to correct any movement away from perfect balance. The seesaw fluctuates and we cannot relax, but if we react correctly it never moves far from the desired equilibrium state. Next time you balance on a seesaw, take a moment to ponder how you are part of a negative feedback loop – bringing equilibrium to an unstable system. In this context negative is good. Economists believe that such negative feedback loops are everywhere. The most basic of all is the mechanism of price – prices rise and fall balancing supply and demand, steering the market towards a stable equilibrium. 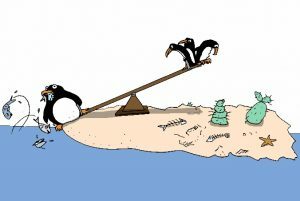 If we set the market free, then `forces’ – penguins on a seesaw or the invisible hand in the economy – will lead us to a happy place called equilibrium – the best of all possible worlds given the constraints. The idea is simple and has become a foundation stone on which the whole edifice of neoclassical economics and neoliberalism is built. The problem is, it is often wrong. The economy is not an equilibrium system at all. There are inputs like energy and losses as goods are consumed. There is no reason to expect that the feedback loops are negative and will lead us to equilibrium. If we do not regulate the forces, we are just as likely to end up in a dystopian world of worker exploitation and environmental destruction, where a greedy elite accumulate all the resource. Equilibrium thinking is dangerous in economics. When it fails, the consequences are disastrous. Think of a bubble – tulip mania, railway mania, Japanese real estate, the German Neuer market – they happen often. In a bubble, the feedback loop inverts – rising prices drive prices higher, pushing us away from equilibrium until something breaks. Think of climate. Energy is the driver of economic activity – burning fossil fuels produces growth demanding more fuel producing more growth. This is a positive feedback loop that will eventually destroy the stability on which economy relies. Equilibrium thinking cannot explain what is going wrong. Are bubble people behaving irrationally, possessed by some extraordinary delusion, singing There’s a good time coming boys? Are people buying diesel behaving irrationally, dismissing energy as just an externality? No! 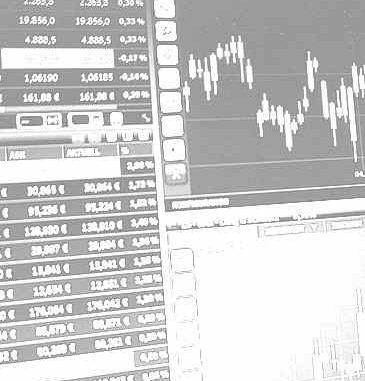 Whether a bubble or climate, market failure is an intrinsic property of the market – instability is an intrinsic property of non-equilibrium systems – and we need to do something about it. Of the tendencies that are harmful to sound economics, the most seductive, and in my opinion most poisonous, is to focus on questions of distribution. A problem for equilibrium economists is that questions of distribution are another example of a positive feedback loop that lead to market failure. People with capital accumulate more capital. Unless we impose an appropriate negative feedback loop, the seesaw collapses and resources flow towards one end. Fortunately not all economists were afraid to drink from Lucas’ poisoned well. Notably, the French economist Thomas Piketty and colleagues have amassed an enormous quantity of data on how wealth and income distributions have evolved over time, see e.g. Piketty’s Capital in the 21st century. From the data we learn that if the negative feedback loops are too weak, inequality rises inexorably until there is a crisis, economic or political. Without negative feedback, the unregulated free market leads us towards an unstable dystopia. The solution may be unpopular but is relatively straightforward. Both the historical data and economic modelling tells us that stabilising the distribution requires progressive taxation, preferably capital taxes. To demonstrate this on the left I compare real data and a simulation. The black dots show the income share of the 1% in the UK over the last 70 years. Note that it is either falling (up until 1980) or rising (thereafter) but never seems to reach a stable equilibrium level. We can simulate the distribution using agent-based modelling. Agents may be chosen to mirror the full diversity of human behaviour from rational to irrationally random, from individualist to collectivist, from lemming to contrarian, from producer to consumer. Into the model we add growth in the money supply, the distinction between income and wealth, and the return on capital. 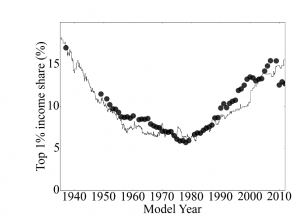 The line shows the result of my rationally-random agent-based model, where tax policy is changed in 1980. Although the model is too crude to capture shocks such the global financial crisis, it does reproduce the long-term trends. Whether my crude model or more sophisticated models, we always find the same thing – tax policy is the main determinant of the long-run distribution of wealth and income. Progressive income tax and capital taxes are an essential component in the feedback loop, restoring stability on the road towards that best of all possible worlds, that the happy place we call equilibrium. The debilitating and destabilising effects of rising inequality present a pressing failing of laissez-faire equilibrium thinking. As one of Brave New Europe’s contributors Wolfgang Streeck has written: capitalism is a collective distributional struggle. Although we are talking more about inequality and the 1%, are we talking enough about what the desired distribution should look like? The 1% are uncomfortable with such talk but they do not have the monopoly on power. The people of Europe should demand that their elected representatives swallow the poison and tell us, what is the desired distribution of wealth and income, and how are we going to get there? Editorial – Why BRAVE NEW EUROPE?